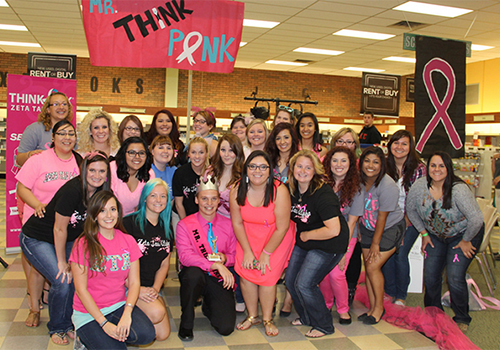 Members of the Eastern New Mexico University chapter of Zeta Tau Alpha (ZTA) pose at the Mr. Think Pink pageant. 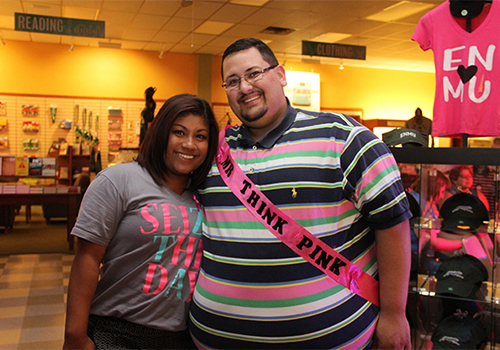 The event helped raised money for breast cancer research. But Eastern New Mexico University Bookstore Manager Peter George knows that the Mr. 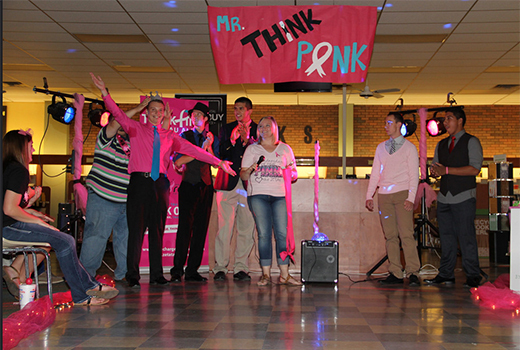 Think Pink extravaganza was held in exactly the right place. Organized by the Eastern New Mexico University chapter of Zeta Tau Alpha sorority, the event brought out 200 participants and helped to raise funds for breast cancer awareness and education. The event also showcased the versatility of the store space and the eagerness of the bookstore team to be of service to the school and its students. George says he’s eager to continue using the bookstore as a venue for campus activities and events, which is located in Portales, near the midpoint of New Mexico’s eastern border with Texas. It is also New Mexico’s largest regional comprehensive university. According to George, the ZTAs completely transformed the space for the pageant, moving the wheeled fixtures out of the way and bringing in professional lighting and sound. “We brought in balloons and tied pink ribbons to all the chairs,” recalled Marissa Mowrer, ZTA’S treasurer and director of philanthropy. Mowrer, who is also the bookstore’s textbook supervisor, dyed her hair pink to motivate her chapter to support the cause. “I promised them [ZTA] that if we raised $1,500 I would dye my hair pink, and that if we raised $3,000 I would dye my eyebrows pink!” she said. In the end, she did both. In addition, the sorority raised money by selling tickets for its murder mystery dinner and jelly bracelets with breast cancer awareness slogans.